Christine DeRosa/Pipe Dream Photographer Sophomore attack William Talbott-Shere scored a goal and recorded an assist in Binghamton’s blowout loss to Vermont. The Binghamton men’s lacrosse team was dominated by the Vermont Catamounts, 14-6, Saturday night. The Bearcats (0-10, 0-4 AE) scored six goals from as many different scorers, but ultimately dropped their fourth straight conference loss as their season-long losing streak continued. The Catamounts (7-4, 4-1 America East) scored twice in the first quarter before senior attack Griffin Konen found the back of the net unassisted to put the Bearcats on the scoreboard. After another Catamount goal, sophomore attack William Talbott-Shere scored to make it a 3-1 game. It wasn’t until there were five minutes remaining in the third quarter for Binghamton to find the back of the net again, as the Catamounts scored six unanswered goals through the whole second and most of the third quarters. 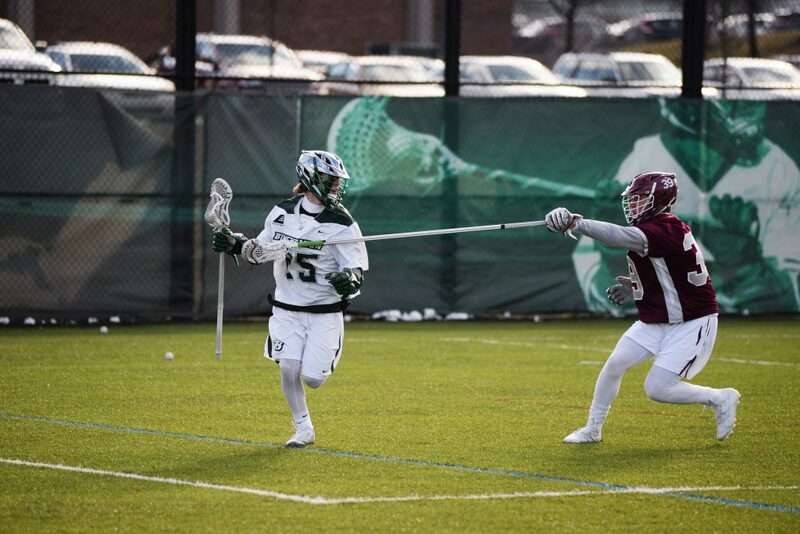 The offense finally got the ball moving around the box, and junior midfielder Jon Perotto dumped the ball in front of the net to senior midfielder Joe Licata for the score at the 4:54 mark in the third frame. This was Perotto’s sixth assist of the season as well as Licata’s team-leading 16th goal of the season. Vermont’s scoring attack was led by senior midfielder Jack Knight, who notched four goals on the day and an assist, including a first-half hat trick, on the way to the Catamount victory. After three more unanswered goals by the Catamounts, senior midfielder T.J. Tiernan put the ball into the top left corner of the cage unassisted at the beginning of the final quarter. The Bearcats scored twice more in the waning minutes of the game, both being the first career goals of the players. Freshman midfielder Andrew Arce found the back of the net off a feed from senior attack Ryan Winkoff and freshman attack Vincent Basile scored off Talbott-Shere’s team-leading ninth assist of the season. Redshirt junior goalie Kevin Carbone was substituted out with three minutes remaining in the game, a substitution which usually happens around halftime. The box score for both teams was similar, as the Bearcats took a total of 35 shots on goal and captured 11 faceoffs to the Catamounts’ 32 and 12, respectively. The differentiating factor appeared to be the Catamounts’ ability to produce on extra-man opportunities, scoring on all three chances while the Bearcats failed to score on any of their six times up a man. The Bearcats will continue to look for their first win as they travel to Sacred Heart this upcoming Tuesday, April 16. Faceoff is set for 3 p.m. from Campus Field in Fairfield, Connecticut.